This dam, part of the Los Angeles aqueduct system, was constructed on a fault. The dam failure caused the deaths of five hundred and it also changed the course of the Santa Clara River. 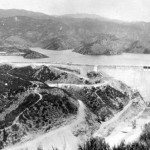 Shortly before midnight on March 12, 1928, the St. Francis Dam, part of the Los Angeles aqueduct system, collapsed and released twelve billion gallons of water, destroying a swath of land all the way to the ocean and killing five hundred people in its path. The dam had been constructed on a fault, a common geological feature in that part of the country. Unfortunately, no geological investigation was made before the dam was built. The collapse of this dam, built by the city of Los Angeles, is a classic example of the neglect of scientific expertise. At that time engineering projects did not consult geologists prior to selecting dam sites. The accident that followed, California’s second worst, next to the San Francisco earthquake of 1906, became a landmark in the history of dam construction. Some have called it America’s greatest civil engineering failure of the twentieth century. Never again, in the multiple-fault, earthquake- prone state of California would a major dam be built without a prior, extensive, geological assessment. The St. Francis Dam was a curved, concrete, gravity dam in San Francisquito Canyon, two hundred feet high, with a span of six hundred feet across the mouth of the canyon, and a dike along one side of the canyon. It was built to provide an additional 38,000 acre-feet of water storage for the Los Angeles aqueduct system. Behind the dam, the second biggest in a chain of storage basins, were twelve billion gallons of water, enough to meet the needs of the city of Los Angeles for more than two months. The catastrophic failure that occurred on March 12, 1928, happened as the dam filled to full capacity for the first time. Only much later, in the light of better knowledge of the geology of the Los Angeles area, was a full explanation provided for the failure of the dam. The architect of the dam was William Mulholland, chief engineer of the Los Angeles Bureau of Water and Power. He had a history of success in the years before 1928 with a variety of projects that were designed to provide both water and hydroelectricity for Los Angeles. It was he who planned and supervised the construction of a 233-mile-long aqueduct that came through the Sierra Nevadas and brought water and electrical power to Los Angeles. Early in 1928 he was working on a very ambitious plan to bring water from the Colorado River across 250 miles of deserts and a series of tunnels to Los Angeles. Thus, when he proposed building the San Francisquito Dam, his plan was enthusiastically welcomed. He was a trusted man, and he was allowed to go ahead with construction of the dam even in the face of warnings from geologists. He ignored their warnings and the local laws of that time allowed him to do this. What he was told by geologists, however, proved to be the cause of the disaster that followed on March 12: they had pointed out that the type of rock under the dam was too weak to sustain the weight of the dam and, furthermore, the dam site was a major geological fault. For about a week before the failure of the dam, farmers in the surrounding area reported leaks and their quantity and volume seemed to increase day by day. On the morning of March 12, one man observed an unusual amount of water escaping through cracks at the dam’s base. This report was immediately brought to Mulholland’s attention. He inspected the location and pronounced it safe. Rain had been falling steadily since March 6 and the level of water in the dam had reached the maximum possible, to the point of overtopping. Either the water release mechanism had failed to operate or it had never been installed. Close to midnight, while most of the residents of the Santa Clara Valley were asleep, billions of gallons of water swept down the Santa Clara River. There was no time for local residents to escape. Houses were crushed, farms turned into seas of mud, and cars tossed around like toys. A wide swath of land, in places as wide as sixty miles, was cleared of everything as the water cascaded along a seventy-five-mile-long path to the ocean. Five hundred people had been killed and damage estimates reached $20 million. This failure represents but one of a number of important dam failures that occurred in the 1920s and 1930s, when American civil engineers were pushing the limits of a technology that was still in its infancy. Like most major engineering failures, looking back on it one can see that considerable long-term societal benefits resulted from the public outcry that followed the disaster. One immediate action was the establishment of a dam safety agency, the first of its kind anywhere. This new organization required geological assessments of dam sites before the design stage, including a normalization of uniform engineering criteria for testing of compacted earth. Foundation material of this kind is still in use worldwide. All the Los Angeles Department of Water and Power dams and reservoirs were assessed in the light of the St. Francis experience and one of the outcomes was an extensive retrofit of the Mulholland Dam. Mulholland’s reputation as an outstanding engineer ended suddenly in the wake of the failure of the St. Francis Dam. 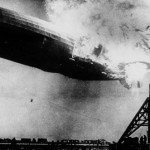 As the Hindenburg came in to land at Lakehurst, New Jersey, it caught fire and, with hydrogen tanks in use, a huge explosion followed. In the evening of May 6, 1937, the German airship Hindenburg was approaching Lakehurst, New Jersey, preparing to land. The ground crew stood ready as the ship reduced its speed, dropped its landing ropes, and prepared to connect with the mooring mast. Suddenly there was a flash of light and before anyone could assess what was happening a gigantic fireball erupted and the whole ship was engulfed in flames. In a few minutes the Hindenburg was reduced to a smoking mass of flames and molten metal. In 1937, Hitler was at the height of his power in Germany and the zeppelin Hindenburg was the biggest airship in the world. As flagship of Germany’s lighter-than-air fleet Hitler wanted to use it in a regular service to the United States to demonstrate the benefits of this new mode of travel. The Hindenburg had made the Atlantic crossing several times in the previous year and this was its first trip in 1937. With its huge size, almost as long as the Titanic, and with enough width and height to provide lounges and dining rooms, it offered a new and luxurious style of air travel. Everyone knew that the gas used to hold the airship aloft was hydrogen, inexpensive to produce and very effective, except that it was highly flammable. A single match or a bullet could easily set off the kind of explosion that occurred at Lakehurst. This may have been the reason for premonitions of doom that were expressed before the flight left Frankfurt. These concerns affected some people so much that they cancelled their plans to travel. Seven million cubic feet of hydrogen was needed to hold the 242-ton ship in the air and the presence of this huge quantity of a flammable gas might also have caused fears. The much safer gas to use in zeppelins was helium, more expensive to produce than hydrogen but not flammable. Germany would probably have used helium had it been available. In the 1930s the United States had control of the world’s supply of helium and was not willing to let a country like Germany have access to it because of all the military buildups taking place in Europe. The debate over helium versus hydrogen was not an easy one to settle and most German authorities finally relied on years of experience with hydrogen-filled airships to support sticking to this gas. It was sixty times cheaper than helium to produce so that was a big factor even if there had been no problem with supply. Helium had only 90 percent of the lifting power of hydrogen, because it was a slightly heavier gas, and Germany was anxious to mount the biggest cargo possible. It even changed the passenger terminal city for the Hindenburg from Friedrichshafen to Frankfurt because the latter was a thousand feet lower in elevation. At the higher air pressure that this change provided the airship could carry an additional seven tons of payload. To avoid the risk of an explosion when releasing gas to allow descent, which had previously led to two explosions, stored water was used instead. The Hindenburg was a new airship. Its first flight took place in 1936. It was a luxury, air-conditioned vessel with twenty-five two-berth cabins to accommodate its fifty passengers. Passengers could live aboard in a style of luxury unmatched in all earlier airships. It was like living in a first-class hotel. Along both sides of the passenger deck was the promenade with seats and with slanted windows that gave clear views of the landscape below. It was always a spectacular scene as the vessel was only 650 feet above the ground or sea level. Passengers boarded the ship via a retractable set of stairs as far as the lower deck, then by a staircase to the top deck. The Hindenburg could travel 8,000 miles without refueling at a speed of 80 mph. The material used for the sides was cotton or linen as these were found to have better resistance to wind and rain than any other materials. A varnish and several coats of aluminum paint completed the outer shell. Everywhere inside the ship the lightest materials were used for framing, usually aluminum. The ship’s brain was the control car, located on the bottom of the vessel close to the front. Two of the key officers always on duty were the rudder and elevator men. The former kept the ship on a fixed course while the elevator man watched four instruments dealing with horizontal and vertical shifts, elevation, and hydrogen pressure. Hindenburg was the first of the zeppelins to allow smoking but the rules for smokers were strict. There was a revolving door that served as an airlock through which people passed to reach the smoking-room. Asbestos lined the walls of this room and no passenger could leave until the cigarette was extinguished in a water-filled ashtray. No one was ever seasick on this airship; its motion was so smooth that often passengers refused to believe it was in the air, quite a contrast to today’s big planes. One popular game that related to the airship’s stability saw people competing to see how long a pen or pencil could be stood on end without falling over. Ernst Lehmann was the captain, a man with long years of experience on zeppelins stretching back to World War I days. As the airship traveled across the Atlantic on its fateful final voyage everything seemed to go well. The weather was good so speed was maintained at 60 mph. This meant crossing the Atlantic in three days. At Lakehurst, New Jersey, there was some delay due to bad weather but the rain and wind had gone by the time the Hindenburg touched down. No one was prepared for the chaos and destruction that followed the spark from somewhere as the nose of the Hindenburg approached the mooring mast. The landing ropes had been thrown down and ground crew was steadily drawing the ship to the ground. Suddenly the whole structure collapsed and fire was everywhere. Some jumped to the ground, others waited until the ship dropped farther down, risking getting incinerated in the process. One passenger called it a medieval picture of hell. Some had no chance of escape and were caught in the flames. The whole conflagration started and was all over in half a minute. Captain Lehmann, who ran back into the flaming fuselage more than once to rescue people, was so badly burned that he died soon after being taken to hospital. Thirty-six people lost their lives and many were injured. The fire burned on long after the airship was a mass of tangled wreckage. Diesel oil from the engines kept it going. An attempt was made to rescue some of the mail and there was some success. People in Germany and across the United States received badly charred letters a few days later. Some looting occurred because the police did not cordon off the area for a few hours. The conclusion as to cause was simple, the ship was destroyed because it had hydrogen. Suggestions of sabotage were given serious consideration but were later dismissed. The fact that a storm had passed over the area just before the ship arrived gave confirmation to the idea that a static electrical charge had built up between the outside of the airship and any metal structures within. It was discovered that the fabric cover, unique to the Hindenburg, was a poor conductor, thus allowing an electrical charge to build up. Immediately after this tragedy, the fabric of other airships was checked and, where necessary, changed to ensure good conduction. Other changes in the aftermath of the Hindenburg explosion saw hydrogen being removed and helium put in its place on all airships. At the same time, new regulations were put in place to anticipate electrical discharges. The electrical gradient between ship and ground was always thereafter measured at landing time. Perhaps if the Hindenburg had decided to get to ground first instead of the mooring mast the story might have been quite different because the size of the electrical charge would have been less. In any case, this one event changed the history of aviation. The zeppelin never regained an important role in air travel and production of new airships was stopped soon after 1937. Sixty-four years later, Friedrichshafen was once again in the news as a new eight million dollars, helium powered, zeppelin was built there for low altitude tourist trips around central and southern Europe. Germany’s alternative to the growing demand for luxury travel across the Atlantic in bigger and more luxurious liners came to a sudden end when the Hindenburg caught fire. A comparable shock had come twenty-five years earlier with the sinking of the Titanic and, as a result, new rules about safety were introduced at that time for all ocean liners. The demand for ways of moving from place to place greatly increased after World War II and, because there were large numbers of people leaving Europe for short or long stays at countries around the world, faster ways of traveling were demanded. In the final years of World War II, jet fighter planes came into use. Immediately after the war this type of plane was seen as the answer to faster modes of travel. By the early 1950s commercial travel by jet planes had started. Like all new developments in the technology of air travel there were risks of failures. To use jets in warfare was quite different from long distance usage with large numbers of people. The wartime ma- chines were light and their length of time in the air on any one sortie was only a few hours. It was a very different challenge to fly a big airliner on jet engines halfway around the world. Britain was a pioneer in this new way of air travel and in 1952 the De Havilland Company launched the first turbo-jet airliner, the comet. It was a thirty-six-seat jet and it could fly from London to Johannesburg, South Africa, at speeds of 500 mph. The British Overseas Airways Corporation (BOAC) adopted it at once and in less than a year comets were flying around the world. Other airlines were equally eager to buy these new jets and De Havilland soon had a waiting list of five for every comet that came off the assembly line. The trip from London to Singapore was one of BOAC’s longest routes and comets were particularly welcome on it because they cut back substantially on the time taken. One comet was flying that route in 1953 and had stopped over in Calcutta en route. As it took off on May 2, 1953, to continue its flight to London everything seemed normal. Six minutes later communication with the control tower was lost. The plane had gone down less than ten miles from the airport and all forty-three on board were killed. This was BOAC’s first fatal crash in five years and the fact that it happened to one of its newest planes was a big shock. Commentators insisted that some unusual weather much have caused the accident. One newspaper concocted a story of a downdraft meeting an updraft of air just where the comet was flying. Many believed it. Another long-distance route flown by BOAC was London to Johannesburg so comets were popular there too. For eight months after the tragedy near Calcutta, nothing occurred to make BOAC change its activities. The comet continued to be enormously popular. Then, on January 10, 1954, a comet from London, one that had stopped over in Rome, took off from there to continue its journey to Johannesburg. There were thirty-five people aboard. These numbers seem small by today’s standards but the 1950s were years that knew nothing about the jumbo plane or even smaller jets of the kind we know now. Jets were still quite new ways of traveling. An Italian fisherman saw this jet shortly after its takeoff while it was high in the sky, then watched it plummet down into the sea near the Island of Elba, about one hundred miles from Rome. BOAC immediately grounded all of its comets and proceeded to conduct a full scale inspection of its entire fleet. Following a meticulous series of examinations, flights resumed in March of 1954 but within a few days another comet went down, this time on the London–Johannesburg route. Commentators and officials now began to ask big questions. Newspaper reports wondered about the basic safety of the comet, asking whether there might be something wrong in the design that no one had yet recognized. A major salvage operation was launched to recover the wreckage of the jet that went down off the Island of Elba and the results were very surprising. There was no evidence of fire, explosion, or engine failure. The only possible explanation for the crash was the condition of the fuselage. It had been ripped apart in several places. Intensive tension and pressure tests on the materials being used in the comet’s fuselage finally revealed what was wrong. The materials were inadequate for long distance travel at high altitudes. The jet’s fuselage was fine for short-range military fighters at low altitudes but it could not cope with repeated pressurization, speed, and high altitude over long distances. The career of the comet came to an abrupt end two years after its debut. Sometime later it was redesigned with better materials but by then other manufacturers like Boeing had captured the jet plane market and the comet was no longer the only choice available. The Yenisei River runs 5,494 km (3,534 mi) northwards from Mongolia to the Arctic Ocean, dividing west from east Siberia. Rushing off the Hangayn Mountains, it is already a mighty force of nature by the time it enters the Russian region of Khakassia; and since 1978 it has driven Russia’s biggest hydroelectric power station. At Sayano-Shushenskaya, a 245 m (800 ft) high dam across the 1 km (0.6 mi) wide Yenisei dwarfs the massive RusHydro turbine hall at its downstream foot. 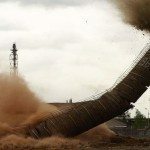 The ten colossal turbines spun remorselessly to supply 25 per cent of Russia’s hydroelectricity and it was a model renewable energy resource. Then it exploded. Three turbines simply ceased to exist. 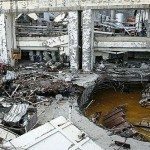 The explosion ripped the concrete roof off the hall as water from the Yenisei swamped what was left, drowning anyone left standing in a toxic flood of 40 tons of spilled transformer oil that later found its way into the river. It took several days even to be sure how many had died. By then, live outcry of the bereaved was magnified by local, regional, national and international alarm about the sequence of the disaster, some of it for shared reasons. The Sayano-Shushenskaya dam supplied 70 per cent of the power for the world’s biggest aluminum producer, RUSAL. The loss of half a million tons of aluminum was only one of the associated economic disasters. Another was the huge oil slick on the Yenisei, heading towards the Arctic and decimating fish farms on which huge numbers of people depend. PCBs in the specialist oil threatened drinking water. On a different level, Russian utilities and hydro-reliant heavy industries took a hammering on stock exchanges round the world. And it still isn’t clear which came first – an explosion causing the flood, a flood causing the explosion, or a human error known only to one of the victims. You should know: Local feeling about the incident’s probable cause is best expressed by the ban imposed in Cheryomushki on strong alcoholic drinks. Can Tho, 170 km (105 mi) southwest of Ho Chi Minh City, is both a province and the biggest city and hub of the Mekong delta. The region is Vietnam’s breadbasket, but the country has always found it difficult to make the most of its prime agricultural resource. Transport has never been straightforward in the huge network of waterways that lie between each of the Mekong’s principal tributaries. The River Hau separates Can Tho from Vinh Long province, and the Can Tho road bridge across the Hau was to be the clearest demonstration of Vietnam’s commitment to providing the infrastructure proper to a modern, rural economy. Its 16 km (10 mi) of ramped approach roads would lead to a 2.75 km (1.7 mi) central span – a beautiful cable suspension bridge arcing across the flat, green waterscape. Construction began in 2004 and three years in the project was going well. It might have been the heavy rain that softened the ground, or just one shortcut too many, or the still-drying concrete poured just the day before. Whichever it was, the scaffolding along the 87 m (270 ft) length of the double span buckled in slow motion and crashed more than 30 m (100 ft) to the ground taking the massive, four-lane, concrete deck with it. 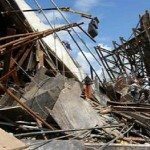 The wreckage stood higher than a five-storey building. None of the 250 workers stood a chance as 2,000 tons of concrete and twisted steel just collapsed. Fewer than a dozen workmen and engineers survived totally unscathed. The bitter irony is that the disaster was not caused by corporate greed. If anything, it was caused by goodwill – the genuine desire of the Japanese building consortium and the Vietnamese government to help the delta farmers get their produce to market quickly. Death toll: 65 dead and 180 injured (most of them severely) out of 250 on site. You should know: The bridge’s opening was delayed from 2008 to 2010, upsetting collateral regional improvement including Tra Noc airport, which re-opened in 2009 as ‘Can Tho International’ but could only offer onward transit by ferry. The Japanese consortium showed immense dignity by apologizing even before the independent enquiry was announced. Safety procedures were immediately reviewed and work was started again as quickly as possible. Gusset plates are not glamorous, but like the two-dollar O-ring seals on the space shuttle Challenger, you take them for granted at your peril. When NASA was still a gleam in John Kennedy’s eye, Eisenhower’s Interstate Defence Highway system was pushing its concrete capillaries across America. In 1967 Minnesota completed its contribution to Interstate 35 West (I-35W) with an eight-lane bridge across the river Mississippi in the heart of Minneapolis. For 40 years it eased the city’s spectacular growth, and it was bumper-to-bumper with rush hour traffic at 18.05 on a hot summer’s evening when stalled drivers heard a screeching cacophony of groans and explosive snapping sounds. The roadway reared up beneath them, twisting in midair – catapulting the helpless concertina of cars like smashed dominoes into the pillar of dust and debris roiling up from the gaping hole in front. Ribbons of highway hung by a single steel thread, tilted down and sideways into the fast-flowing Mississippi. Chunks of road dropped 35 m (110 ft) perfectly flat to the river banks, like concrete salvers still bearing cars and trucks with their stunned and shaken occupants. But where the three central spans – 330 m (988 ft) of I-35W’s 615 m (1,907 ft) total – crumpled in a mockery of their former geometric confidence, the ugly detritus of steel tresses was woven with human rag dolls, and trickled blood. 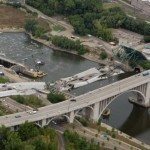 The collapse was Minnesota’s worst-ever man-made disaster. It inspired heroism and provoked a blizzard of lawsuits. A 15-month enquiry found that at the very bottom of the well of minor mishaps that had accumulated coincidentally into a disaster were 24 (out of many) gusset plates of the wrong size. They had not been spotted in the original review process, and had therefore been incorporated into I-35W’s design and original construction. Death toll: 13 dead and 145 Injured. You should know: Surprisingly few people were hurt, it seems a pity that with providence on the survivors’ side for once, teams of lawyers are still pursuing class actions in the hope of squeezing someone – anyone – for a few bucks. Even though I-35W was a disastrous accident, lawyers are bent on finding someone to blame. Bharat Aluminium Co (Balco) is one of India’s major companies, a subsidiary of Vedanta Pic, the conglomerate listed on the London Stock Exchange. Balco is building a new power plant at Korba, in the northeast of Chhattisgarh state, using the firm Sepco as its chief sub-contractor. There were over 3,000 workers on the site on the day in question. The weather was foul, with heavy rain shot through with lightning. Those not assigned to a specific task huddled anywhere they could in search of shelter. A large number found it in and around the shell of the nascent chimney, already 106 m (330 ft) high. It was the worst place to be. Without warning the laborers were showered with tons of ragged concrete blocks as the chimney crashed to the ground, burying them in mud, steel and rubble. By the next day only nine survivors could be found; another two were pulled out six days later. After two weeks rescue workers with 30 earth-moving machines had found some 40 bodies – but a witness estimated there must be at least another 60 still buried. There was no reliable list of employees to guide rescuers; and site security had no real idea how many people were even working there. The charges against Balco’s men include ‘culpable homicide’ and ‘conspiracy’. Death toll: An estimated 100 dead and 11 injured, although it could be many more. You should know: According to the United Nations International Labour Organisation nearly 50,000 Indians die from work-related accidents or illness each year. A senior official confirmed that the Indian government was looking into trades union leaders’ accusations that Balco had been using ‘low-quality materials’ for the building of the Korba chimney.